The Reaves Collection, compiled by Bill Reaves, of Wilmington, North Carolina, was donated by him to the North Carolina Room of the New Hanover County Public Library during the 1990’s. The collection came about in 1971 when Mr. Reaves was an employee of the Wilmington Star-News and keeper of the “newspaper morgue.” When the company decided to have 100+ years of newspapers destroyed, he was, to a large extent, able to personally salvage them. The bound volumes of newspapers found their way to his home and from there began a most unusual collection of Lower Cape Fear historical and genealogical materials, a compilation which consumed the rest of his life. Bill Reaves spent nearly thirty years clipping the old newspapers, and then dating, cross-indexing and filing the clippings. Mr. Reaves generated individual file folders for local history subjects, local buildings, local addresses, local organizations and family (surname) files. He then organized the clippings within some of the folders chronologically and in some cases proceeded to type up extracts of the information. The organized folders then became the basis for his many publications. Some clippings date back to the mid and late 1800’s. While the bulk of this clipping collection dates from 1860 through 1960, Mr. Reaves also added clippings from the newspapers of the 1970’s, 80’s and 90’s, as well as various interesting, and often surprising, ephemera he collected as a champion of local history over the years. These folders have benefited numerous museums, galleries, researchers, genealogists and historical institutions around the state and country. 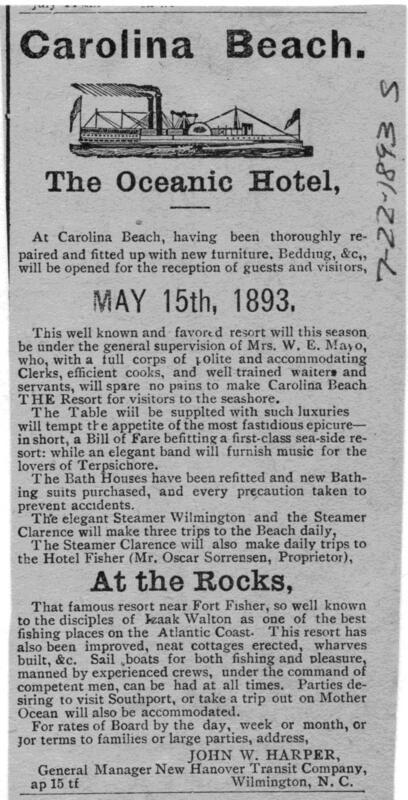 It is important to understand that the Wilmington newspapers reported events happening not only in New Hanover County but also in the surrounding counties – Brunswick, Duplin, Pender, Onslow, Columbus, Bladen, Sampson. All of the Reaves Collection material is located in the North Carolina Room, on the second floor of the Main New Hanover County Public Library in downtown Wilmington, North Carolina. His body of work consists of some 9,000 clipping folders, 50+ publications, and too-many-to-count typed manuscripts. The Collection is organized into five sections: Publications (on the shelves of the North Carolina Room, New Hanover County Public Library), Block Books (clippings organized by street address), Series I Family Files chronologically organized and typed (900 surnames, bound, each surname has an individual index), Series II Family File clippings (some organized chronologically, mostly loose clippings), and Subject files (a few organized chronologically, mostly loose clippings). Not every article was necessarily clipped and saved, nor are clippings for every newspaper issue or even every year captured in these files. Many newspaper issues were unsalvageable. Some folders contain hundreds of clippings, while others may have only two or three. Mr. Reaves was working with one set of newspapers, requiring him to assign each article to one Block Book file or one Family file or one Subject file, as well as dealing with the articles on the back side of each page as the pages were being clipped.. To partially overcome this limitation, Mr. Reaves included frequent cross-references – following these will require the researcher to examine additional FAMILY or SUBJECT files and/or refer to the available newspaper microfilms.